1. Assess the cultural fit of the job candidate. Maintaining cultural consistency within your company is a crucial factor in the productivity and satisfaction of your employees. A recent study showed that 46 percent of small-business new hires failed within 18 months, and a whopping 89 percent of those failures were directly related to poor cultural fit within the company. How can employers assess candidates’ ability to blend with their company culture? 2. Consider a trial period. Flexibility within a company allows employees to feel valued, and shows them their needs are recognized and respected. How important is flexibility to job seekers? In a recent study, nearly 75 percent of American adults surveyed said flexibility is one of the most important factors in their job search, and 39 percent have already left a job, or have considered leaving due to issues with flexibility. Work-life balance within an organization is always a major consideration for job prospects, so offering flextime and other accommodations for workers’ personal lives is an important factor in competitively attracting, hiring, and retaining top talent. According to research from Jobvite, HR executives rated referrals as the number one source of quality candidates. They also generate 39.9 percent of all hires. Employees hired on referral are also proven to be more loyal, as 46 percent of referred employees stay 3 years or more, compared to only 14 percent of hires from job boards. Referrals not only reduce turnover and recruiting efforts, but also empower employees by allowing them to have input in hiring processes. 5. Implement an onboarding program. Introducing an onboarding program into your hiring process can mean the difference between retaining a top employee for a lifetime, and watching them walk out the door after two months. Companies who implement an effective onboarding program during the first three months of new-hire employment experience 31 percent less turnover than those who don’t, according to the Aberdeen Group. Onboarding is important because it introduces the employee to the company’s culture and expectations, and gives the employee vital training and information needed to succeed in their new position. A new hire’s company compatibility will likely be determined during the onboarding process, which saves the employer from prolonged investment in the wrong employee. 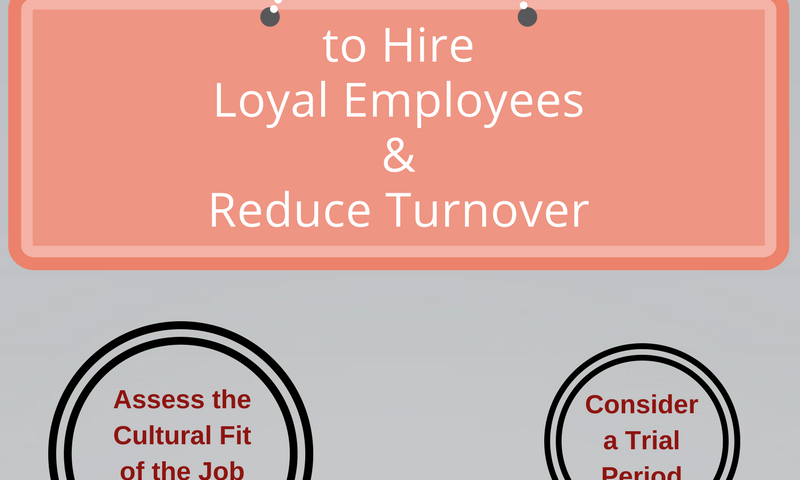 If your organization is experiencing high turnover rates, you may be telling yourself “the employees of today are not loyal like they were in the past,” or thinking, “there’s nothing I can do about it.” However, a more likely answer is you’ve simply been hiring the wrong people, and through the implementation of these five strategies, you can identify and hire talented, loyal employees.